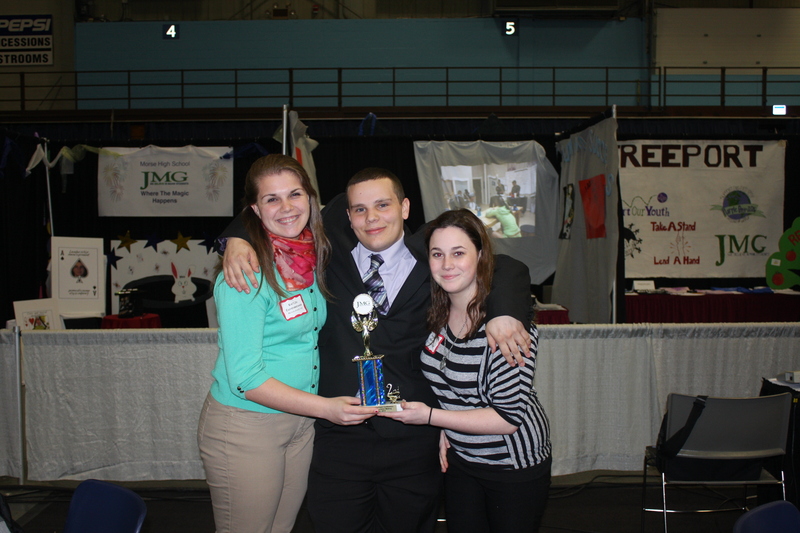 Messalonskee High School Jobs for Maine’s Graduates (JMG) students earned a record number of trophies (7 in total!!!) at the Augusta Civic Center during JMG’s annual Career Development Conference. JMG students from across the state attend this conference each year and compete against other JMG programs in ten events to include: Public Speaking, Communications, Employment Application Packet, Decision Making, Employment Interview, Group Challenge, Imagination Station, Presentation Power, and Marketplace Design and Presentation. When students were not competing, they visited a Career and College Fair, spoke with Maine Game Wardens, and visited other school’s Marketplaces, among other activities. MHS JMG students earned eight trophies throughout the day, which is a record for the MHS JMG program. MHS Senior Kaitlin Eschenbrenner was one of two seniors to earn the Maine State Chamber Scholarship! Congratulations to all those who competed in the day’s events. This entry was posted in Blog Posts (General), Events / Dates, Newsletters. Bookmark the permalink.